I've seen a few RC x-wings on the web (there's even a trainer in this forum). But they usually have a canard up front or a pusher/slot prop. All creative and viable ideas, but I've been thinking about something a bit more scale looking with EDFs. However, many challenges to overcome. My first thought is 2 or 4 EDFs out back with an additional EDF up front for pitch control. You'd need a gyro to balance all the motors. If that's too tricky, another option is a canard made of transparent material (Plexiglas?). Functioning S-foils would be another cool option. How would that change the center of lift? I have nothing to offer in terms of expertise on feasibility, so instead I'll offer my undivided attention and a stream of flowing encouragement. 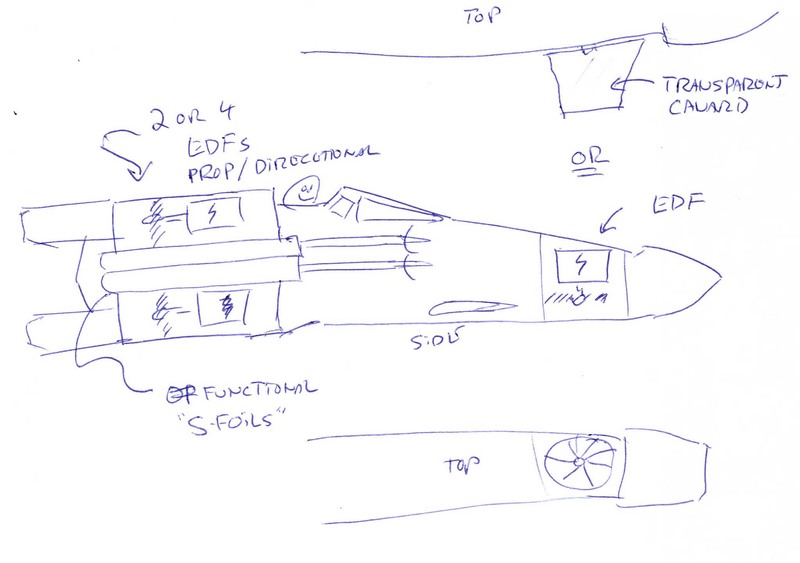 I think getting an EDF to work in the nose would be tricky but a canard would certainly be possible. Maybe even make it out of a clear material (like lexan) just to give a more authentic look. It could even pivot and serve as the elevator channel. I think a canard is mandatory. I remember watching a series of YouTube videos about someone building an RC X-Wing as scale as possible. If I remember correctly, he had a canard, took it off, then ran into a lot of issues trying to get it to fly well again. As Rames and SnowRocker88 pointed out, if you go with a clear material for the canard, you're not really going to see it. I can tell you from experience, and others have come to the same conclusion, the CG of the X-wing is right at the leading edge of the wings. On the crappy trainer/profile X-wing I made, I increased the wing area a bit to help it fly better. It was a guess with the original design (which I never changed the design). I just don't know how much weight you can get away with on the plane. Even though it's a bi-wing of sorts, they're still small wings. At least you won't have to add any dead weight (or even battery weight) to get the CG correct. So you should be able to keep the weight down by using a small battery. My thought was treating it almost like a quad copter. I.e., all the lift and directional stability comes from the motors. I, however, have zero EDF and quad experience. How fast can EDFs change thrust? How fast can EDFs change thrust? Not very fast at all. Yup. The EDF in the nose probably isn't very feasible. There are probably better EDF multirotor videos out there, but as you can see it doesn't work very well due to the slow acceleration of the EDFs. That is a cool looking plane. Thanks.